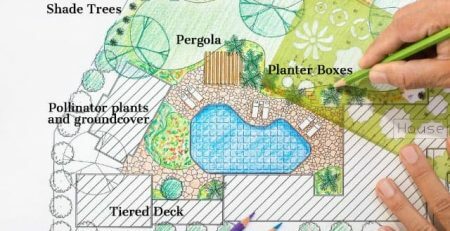 If you’ve decided you’re adding a backyard pergola to complete your patio design and create a little shade for those soon-to-return sunny days, here are a few steps that’ll walk you through how to measure and find the pergola dimensions and size that will fit your space. We’ve outlined how to measure for a pergola attached to a wall or a freestanding pergola. 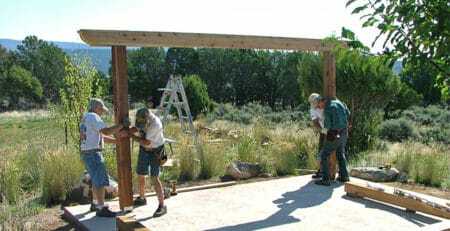 For our pergola kits, standard pergola dimensions range from 8×8 to 20×20. Once you take your measurements, you’ll know if a standard size will work, or if you’ll need to request a custom pergola size. One of the first considerations is how much useable space would you like inside the posts (or between the wall and posts), and how much overall roof coverage will you need? 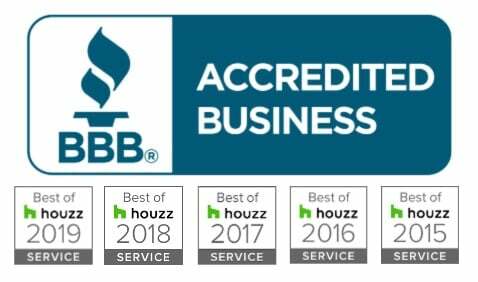 You may need a specific amount of space inside for patio furniture, planter boxes, outdoor kitchen components, or a hot tub; and you may want a specific size roof structure to provide for the most coverage that your space will accommodate. Look at the space you have and consider how much room you’d like inside the posts and under roof. The overall dimensions of our pergolas determine the size of the roof structure. The inside area is always a bit less. 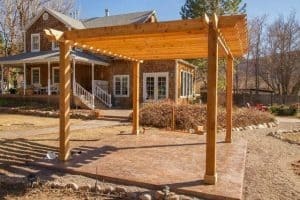 What are Standard Pergola Dimensions? 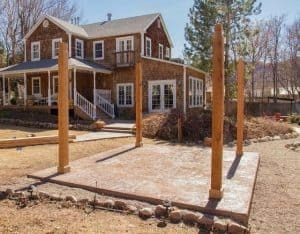 Take measurements to determine the best pergola size for your space. 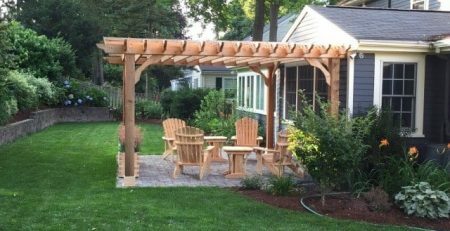 Standard pergola dimensions might not be ideal for your patio, so you can ask for a custom size pergola. 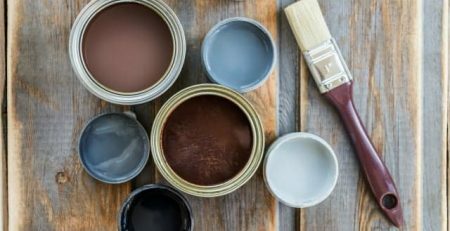 Once you have an idea of the location and amount of space you plan to use, now you can take measurements to determine the actual size that’ll work best to turn your backyard into the relaxing outdoor space you’ve envisioned. Our standard pergola kit sizes are listed as Rafter (projection) x Beam (width), measured from outside tip to outside tip with a 1’6″ overhang past the post of each side for freestanding kits. For example, a 13’x19′ Freestanding Big Kahuna will have 13′ rafters and 19′ beams, with an outside post to post dimension of 10′ x 16′. With no post on the wall side, the attached version of the same kit would have the same overall measurement of 13’x19′, but with an outside wall to post on the rafter side of 11’6″ and a beam side post to post measurement of 16′(11’6″x16′). For more detailed instructions, read How to Measure for a Pergola and review our Pergola Footprint Diagram, which contains the standard pergola dimensions for our wood pergola kits. 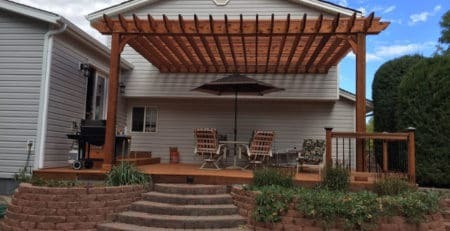 This comparison of pergola styles is a good overview of the different pergola styles we offer in standard pergola dimensions as well as custom. 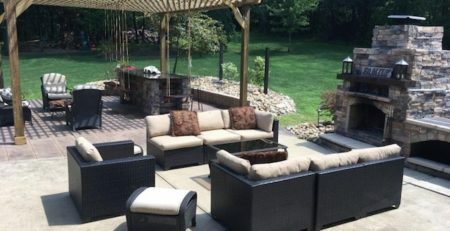 Have fun measuring and planning for your backyard retreat!